A long-lost radio script for an episode of a proposed Doctor Who radio series, to be made in the late sixties, and starring Peter Cushing as the Doctor, has been discovered in the BBC archives. 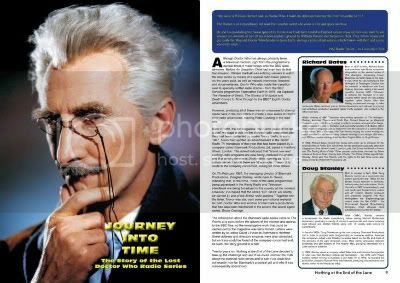 Journey into Time was written by Malcolm Hulke, who went on to write some of the most regarded scripts of the classic series of Doctor Who. In the radio play, a pilot of which was recorded but never broadcast, the Doctor, accompanied by his granddaughter, ends up in the midst of the American Revolution. The recording has been lost for many years. The series was proposed as a collaboration between independent company Stanmark Productions and Watermill Productions, who put forward plans for 52 episodes to be made for Australia and other overseas territories. It would star Cushing, who had previously played a character called 'Doctor Who' in the two Dalek movies made earlier in the decade. Its existence was known about through promotional material discovered in 1989, but the script was thought lost until it was discovered by Richard Bignell in a file of merchandising queries held in the BBC archives. The series was rejected by the BBC with Martin Esslin, head of sound drama, saying: "As a typical commercial production for unsophisticated listeners in Australia or even some parts of the United States, it stands up quite well. As a piece of science fiction, however, it strikes me as extremely feeble." 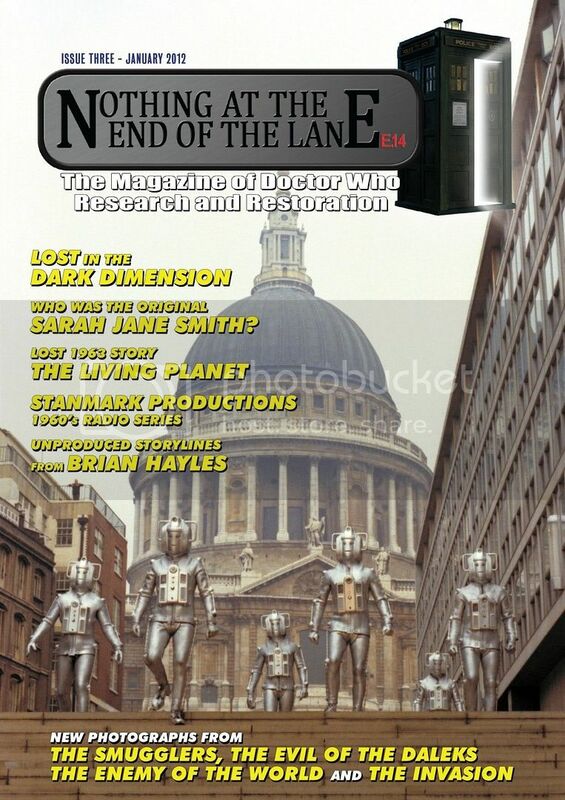 The story detailing precisely what happened back in 1966/67, along with the original pilot script, is detailed in the third issue of the production research magazine Nothing at the End of the Lane, published on Monday 16th January. 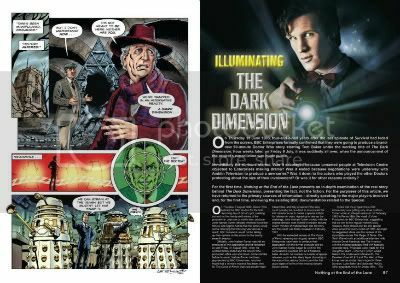 Illuminating The Dark Dimension: A 30-page article looks at the planned anniversary special, seeing how far things really got, and for the first time reveals precisely the reasons why it all fell apart. With artwork by Lee Sullivan. The Original Sarah Jane Smith: So who really was originally cast as Sarah Jane Smith back in 1973? All is revealed and the actress concerned tells what happened. The Living Planet: A look back at one of the first stories proposed for the new series, written by Alan Wakeman during the summer of 1963, with the full proposed storyline and draft script for the first episode. Designing The Space Pirates: Costume Designer Nick Bullen shares his costume designs from The Space Pirates, and for the first time since 1969 we get an idea what Dom Issigri looked like! Hayles Storm: ten unmade storylines submitted by Brian Hayles to the production office between February 1965 and May 1975, are reprinted and reviewed, covering the first four Doctors, featuring more Ice Warriors, the return of the Celestial Toymaker and a meeting with the Toymaker's half-sister, The Queen of Time. The Evil of the Daleks - The Chris Thompson Off-Screen Photographs: For the first time, the 26 off-screen photographs taken by Production Designer Chris Thompson from the first episode of The Evil of the Daleks are published. The article also features photos from Chris's personal collection showing the filming done at Ealing in the Emperor's chamber. New Location Photographs: New colour photographs taken during the location filming of The Smugglers and The Invasion and new b/w photos from The Enemy of the World. 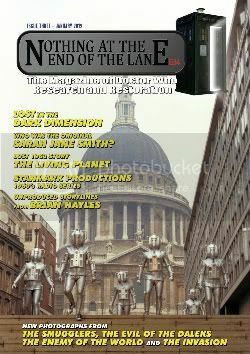 The 116-page, full-colour magazine is available to order from the Nothing at the End of the Lane website.